In the heart of Vienna, you will easily spot the giant spire of the magnificent Gothic cathedral, St. Stephen’s, soaring 450 feet skyward. If you are on the famous Ringstrasse Road that surrounds Vienna in a circle, look up to the most imposing spire that is St. Stephen’s. 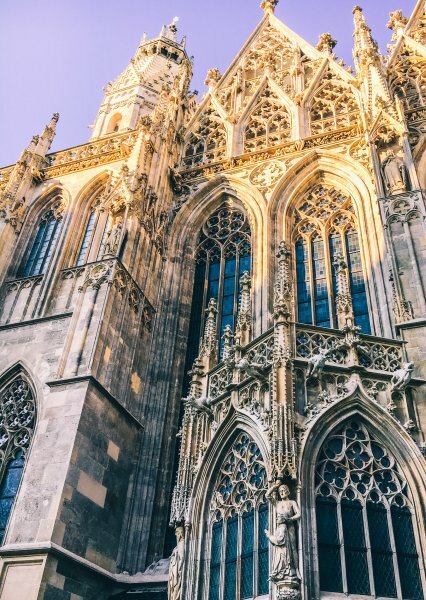 This area of Vienna is a UNESCO World Heritage site, and this cathedral is one of central Vienna’s top landmarks, attracting more than a million visitors each year. Built in the 14th and 15th centuries, the cathedral has grown over time. A fun fact is that Wolfgang Amadeus Mozart got married here in 1782. St. Stephen almost escaped damage while bombs fell all around it during World War II. But in April 1945 the cathedral suffered a direct hit. The entire wooden roof of the nave collapsed and burned, burying the Gothic choir stalls. Then a second bomb hit the flooring and destroyed the large bell – only the clapper survived. Vienna fared better than many bombed areas after the war, as funds came in to rebuild. St. Stephen’s Cathedral was renovated and fully restored by 1952 with donations from Austrians who wanted to save their loved monument. A cathedral stamp series, as well as aid from other countries, funded further restoration. The rebuilding of the North Tower took 22 years, until 1976. The inside of the cathedral is a place of rich-colored wood, graceful arches and hushed beauty. 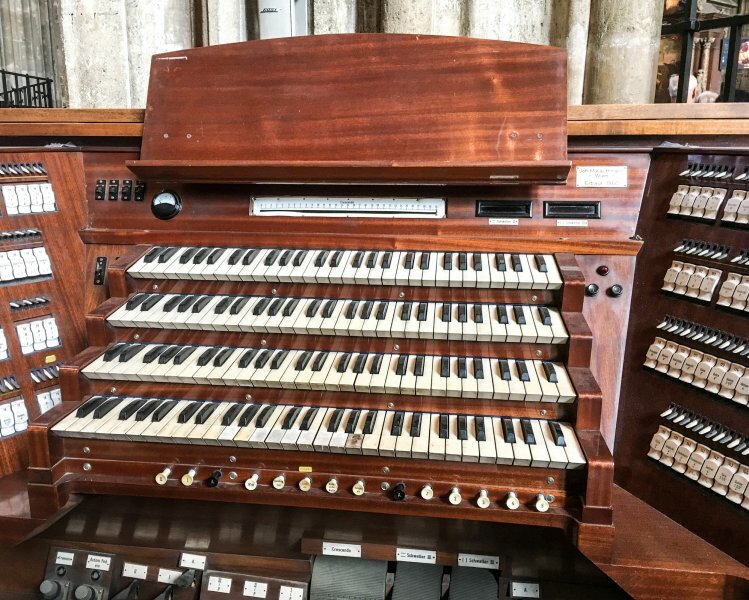 You may happen to witness a choir rehearsing or an organist at the keyboard during your visit. It was crowded during our visit, so we headed back outside to find the entrance to the winding stairs up to the tower and its viewpoint. This is definitely worth the climb of 343 steps, if your knees cooperate. Up here, we found an intriguing carved note in the stone wall: Kirchenbrand, 11.-14.IV.1945. A local saw our interest in this inscription and explained its meaning. We learned that an allied bomber, aiming for a nearby industrial plant that’s visible from the window, dropped a bomb on the church by mistake on April 11, 1945. Fire ravaged the church for 4 days. One casualty was the giant bell. You see the empty place where it hung as you make your way up or down the stairs. A new bell is now in another tower and the former room remains empty. The roof of the cathedral, which was also destroyed, has been rebuilt with lovely mosaic tiles on close-up display from the tower. St. Stephen’s Cathedral is open year-round to the public, with many events and concerts around festive times, and various guided tours in English and other languages are available. To keep the cathedral open today, an institute created by the mayor in 1987, works to raise donations. Strolling along in Vienna, you may find it difficult to imagine that this stately city was bombed 52 times in World War II, and rubble reigned at war’s end. Vienna today is clean, with modern shops lining these central streets. St. Stephen’s Cathedral and its ornate spire towers over central Vienna, a tribute to restoration efforts and money given by so many people. If you look closely inside the old tower of the cathedral, you’ll find signs of the history of Vienna, too.